And nobody seems to care. When my parents used to tell me, as a young child, about the anti-Semitic attacks they suffered in Poland, even before the Holocaust, I always wondered: ‘Why did people not stop the attackers?”… we know now – most people just do not care a fig, especially Americans, Europeans, not to mention Israelis. Once a community was marked Homo Sacer (see Agamben) their blood is free, and anyone may do to them what they will. The Palestinians are not just the Jews of the Jews, but the real Jews of postmodernity. How depressing this story of the courage of small groups in the face of the state of inhumanity, Israel. And yet, the boats keep coming, from different parts of the world. People understand the raw force, the brutal might of Israel, they remember the vicious attack on Mavi Marmara and the murder in cold blood of nine protesters, and despite all this, their commitment to justice in Palestine makes them take those enormous risks, face dangers and abuse, in order to prove that the world knows, listens, and remembers. Israeli forces have intercepted a boat carrying pro-Palestinian activists seeking to breach the naval blockade on Gaza. A military spokeswoman said no one was hurt when marines boarded the Estelle, which was rerouted to Israel‘s southern Mediterranean port of Ashdod. A campaigner said the boat had “come under attack” after being pursued by Israeli naval vessels. 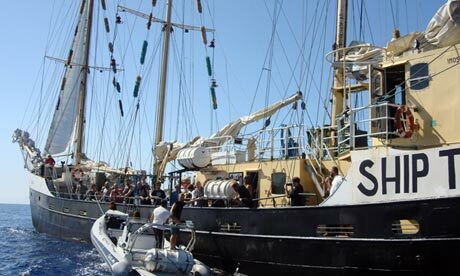 Activists said they lost contact with the Swedish-owned, Finnish-flagged boat early on Saturday. “The Estelle is now under attack. I have just had a message from them by phone. Some time ago, they said that they had military ships following them,” Victoria Strand, a Stockholm-based spokeswoman for the Ship to Gaza Sweden campaign, told Agence France Presse (AFP). She added that it was unclear what the activists onboard meant when they said they had been attacked. The Estelle is carrying 30 activists from Europe, Canada and Israel, humanitarian cargo such as cement, and goodwill items such as children’s books. Israeli army radio reported that its naval forces had ordered the Estelle to halt its course. The Estelle is the latest in a series of vessels manned by activist that have tried to challenged Israel’s blockade on Gaza, imposed after Hamas seized power in 2007. It left the Italian port of Naples on 7 October with about 20 people from eight countries on board. Israel maintains a tight naval blockade of Gaza, which it maintains is necessary to prevent arms smuggling to Hamas and other Palestinian militants. Palestinians describe the blockade as a collective punishment on Gaza’s 1.6 million residents, and supporters abroad have mounted several attempts to break it by sea. Nine Turkish activists were killed in May 2010 when Israeli naval commandos boarded their flotilla of six ships. An inquiry into that incident commissioned by UN secretary-general, Ban Ki-moon, found that Israel’s Gaza blockade was legal but criticised the navy for using excessive force. Organisers of ship carrying pro-Palestinian activists seeking to reach Gaza say Israeli soldiers have boarded vessel. shortly after being approached by Israeli vessels, a spokeswoman said.”The Estelle is now under attack – I have just had a message from them by phone,” Victoria Strand, a Stockholm-based spokeswoman for the Ship to Gaza Sweden campaign told the AFP news agency on Saturday. According to Dror Feiler, another spokesperson, the Estelle, whose passengers include five parliamentarians from Europe and a former Canadian politician, was attacked at around 08:15 GMT. “Five or six military vessels surrounded the Estelle. Soldiers wearing masks are now trying to board the ship. The attack took place on international water: N31 26 E33 45,” Feiler said. The Israeli military confirmed that the ship was boarded, after first denying that they had attacked or boarded it. “A short while ago, Israeli navy soldiers boarded Estelle, a vessel which was en route to the Gaza Strip, attempting to break the maritime security blockade,” it said in a statement. It said that the Finnish-flagged vessel was being led to the southern Israeli port of Ashdod. The Estelle, the latest ship to try to break Israel’s blockade on Gaza as part of the ‘Freedom Flotilla’ movement, set sail from Naples in southern Italy. Luigi de Magistris, the mayor of Naples, met with members of the crew during a visit to the Estelle in the city’s port. The Estelle, whose voyage is being organised by an international pro-Palestinian coalition, is carrying humanitarian goods to the Gaza Strip. There are 17 activists from around the world on board, including passengers and crew from Canada, Israel, Norway, Sweden and the US. GAZA CITY, Palestinian Territories — Jewish-American scholar and activist Noam Chomsky reportedly called for an end to Israel’s siege of Gaza, on his first ever visit to the Hamas-ruled enclave on Thursday. Chomsky, who was in the Gaza Strip for a conference at the Islamic University, called “to end the Israeli siege on Gaza,” a member of Gaza’s legislative council and head of the university’s administrative board, Jamal al-Khudari, told AFP. “The Palestinian people have a right to live peacefully and in freedom,” Khudari also quoted Chomsky as saying. Israel says its blockade of the coastal strip, first imposed in June 2006 and tightened in September 2007, is necessary to prevent weapons from entering the Palestinian territory ruled by the Islamist movement. “Our trip to Gaza was very difficult, but we arrived here and I saw several things which I hoped before to see,” Chomsky said in remarks broadcast on Palestinian television from the university on Thursday evening. In May 2010, Israel barred Chomsky from entering the West Bank, where he was to deliver a lecture. He finally broadcast his speech by video link from Jordan. On Saturday, Chomsky was to deliver a speech on the Arab Spring and the future of foreign policy in the region. He will also meet with NGOs, especially human rights groups, Khudari said. The Palestinian lawmaker noted Chomsky, travelling with an academic delegation, coordinated his entry to Gaza through the Rafah crossing with Egyptian authorities. Chomsky is a professor of linguistics at the US Massachusetts Institute of Technology and a prominent critic of American foreign policy. He has frequently spoken out against Israel’s occupation of the Palestinian territories. The Jewish-American intellectual and staunch critic of Israel is in Gaza to attend a conference at Gaza’s Islamic University over the weekend. Jewish-American linguist Noam Chomsky traveled to the Gaza Strip on Thursday to attend a conference at Gaza’s Islamic University. Chomsky called on Israel to put an end to the blockade on the Hamas-ruled costal enclave, the French news agency AFP reported. Chomsky entered the Gaza Strip from the Egyptian side of the Rafah Crossing as a member of an academic delegation that is scheduled to partake in a conference at the Islamic University over the weekend. This is Chomsky’s first visit to Gaza. Khudari told AFP that Chomsky is scheduled to lector at the university on the Arab Spring and foreign policy in the Middle East on Saturday, as well as, meet with members of several Palestinian human rights organizations. “We organized a program for him to tour refugee camps,” Khudari told AFP. Chomsky, 84 is a professor emeritus at the Department of Linguistics & Philosophy at MIT and one of the most influential intellectual figures alive today. He spent a few months in the 1950s in Kibbutz Hazorea, in the Western Jezreal Valley. He is known as a staunch critic of Israeli and American foreign policy. In 2010, he was barred entry to Israel when he tried to enter from Jordan en route to lector in a university in Ramallah. Israel’s refusal to allow Chomsky to travel to the West Bank received considerable coverage in the foreign press and blogosphere.